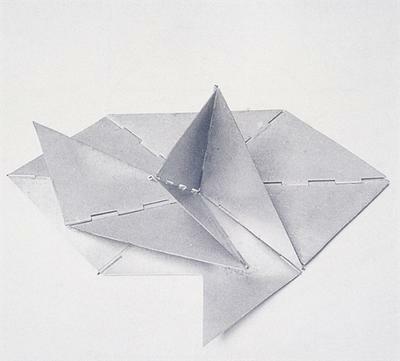 Lygia Clark, Metamorphosis I (1960): these objects are made out of aluminum with hinged edges that remind one of orgami (though the artist would probably disapprove of comparisons to origami). Clark's "Caminhando" (or "Trailings") series involved folding and cutting paper. Matthew McWilliams, Paper Works (Blue) 3 (2010): the photographer did a series of Paper Works in which he folded white paper, photographed it against a white background, and then prented the result onto the folded paper.